Yellow Vest protestors in Paris battled police during violent clashes Saturday — newly enraged at the more than billion dollars that have been pledged to rebuild fire-damaged Notre Dame Cathedral, overshadowing their anti-wealth cause. Black-hooded demonstrators set fire to trash cans, scooters and a car and pelted police with rocks to draw attention anew to their 23rd weekend of protest. Many protesters are frustrated that the international effort to help Notre Dame has drawn more attention than their five-month-old Yellow Vest movement against wealth inequality, The Associated Press reported. Many protesters were deeply saddened by the fire at a national monument. But many are angry at the $1 billion in Notre Dame donations that poured in from tycoons while their own demands remain largely unmet and they struggle to make ends meet. Authorities deployed 5,000 police around Paris and warned protesters to keep away from Notre Dame and the banks of the Seine. The Paris police headquarters said authorities detained 126 people by early afternoon and carried out spot checks of more than 11,000 people trying to enter the capital for Saturday’s protests. 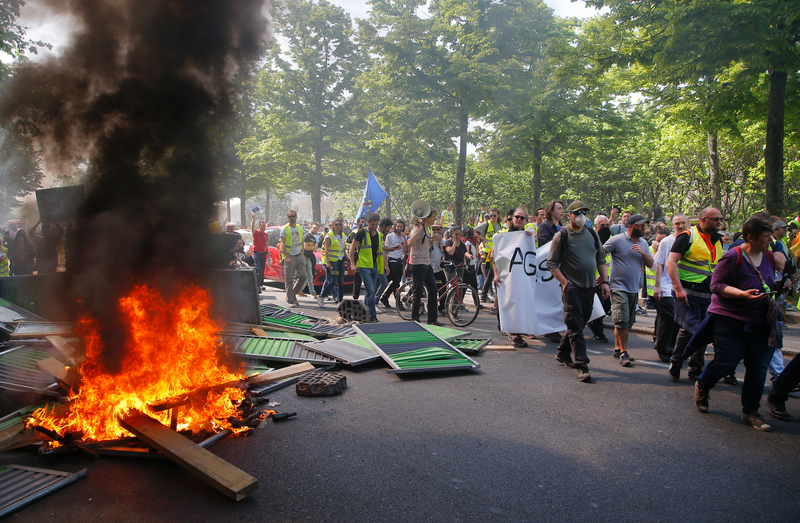 Police fired tear gas amid tensions at a march of several thousand people from France’s Finance Ministry toward the Place de la Republique plaza in eastern Paris. Barricades were set ablaze at one spot, and branches set on fire elsewhere. Firefighters quickly responded to extinguish the flames. Police in other parts of France reported more Yellow Vest protests Saturday. French President Emmanuel Macron plans to announce a new policy push in response to the “Yellow Vest” protest on next week, Reuters reported. Macron had intended to announce the new policies Monday but canceled the announcement because of the cathedral fire. POZAREVAC, Serbia – Several dozen former allies and supporters have attended the funeral of Mirjana Markovic, the widow of late Serbian strongman Slobodan Milosevic who was dubbed the “Lady Macbeth” of the Balkans because of the huge influence she had on her husband. Markovic’s ashes were placed Saturday in her husband’s grave in the backyard of the family house in the central Serbian town of Pozarevac. Milosevic was buried there in 2006 after he died while on a genocide trial at a U.N. war crimes tribunal. Markovic, 76, died last week in Russia, where she had been granted asylum. The ex-Serbian first lady had fled to Russia in 2003 after Milosevic was ousted from power in a popular revolt and handed over to the tribunal in The Hague, Netherlands. Shadow Home Secretary Diane Abbott has apologized after she was pictured drinking alcohol on a London Overground train. It is illegal to consume alcohol on any bus or train run by Transport for London’s network, the BBC reported. The rule was introduced in 2008 by Boris Johnson when he was mayor of London. The Sun obtained a photo of the politician drinking the alcoholic drink. Abbott, Labour’s spokeswoman for domestic affairs, previously campaigned to cease the sale of inexpensive alcohol, received some support from social media users who gave her their best alcoholic suggestions. “It’s absolutely fine. I’m sorry your privacy was invaded,” writer and producer Simon Blackwell responded. “No need to apologize..next time try Pink Gin with Rose Lemonade… very refreshing,” a tweet read. Protesters have set small fires and police have fired tear gas on the sidelines of yellow vest demonstrations in the French capital. The march was one of several actions around Paris and other French cities Saturday. The protesters are angry at high taxes and economic injustice, and are largely peaceful. Some are also frustrated that the effort to save fire-damaged Notre Dame Cathedral is eclipsing the yellow vest movement’s demands. French yellow vest protesters are marching anew to remind the government that rebuilding the fire-ravaged Notre Dame Cathedral isn’t the only problem the nation needs to solve. Multiple protest events are planned around Paris and other cities Saturday for the 23rd weekend of the yellow vest movement against wealth inequality and President Emmanuel Macron’s leadership. One group wants to march on the presidential palace despite bigger-than-usual police presence. Another is aimed at showing yellow vest mourning over the Notre Dame blaze while also keeping up pressure on Macron. 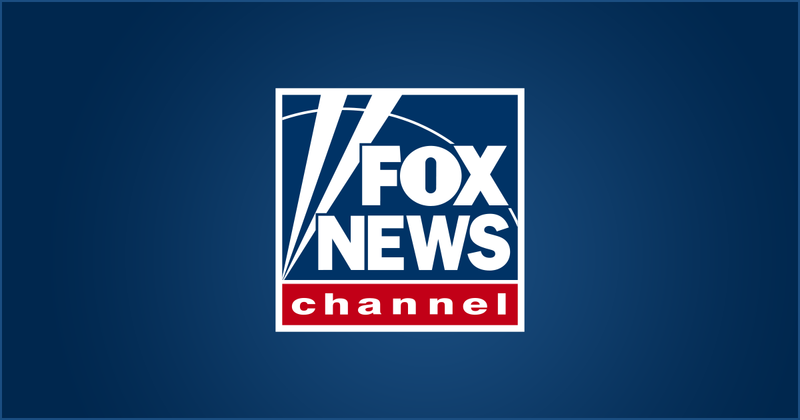 FUNCHAL, Portugal – Portuguese media says that a German army plane is evacuating 12 German tourists who survived this week’s bus accident on the island of Madeira that claimed 29 lives. Portuguese state broadcaster RTP says Saturday that one German survivor will remain in the hospital in the island*s capital, Funchal. Another German injured in the crash was flown out on Friday, RTP says. 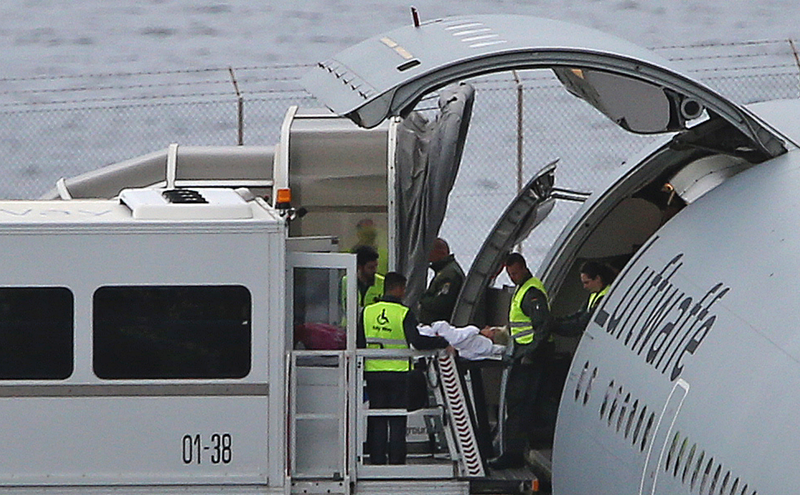 An Associated Press photographer saw the German military plane take off from the Cristiano Ronaldo international airport on Madeira after the patients were taken on board. The bus plummeted down a slope in Wednesday’s crash, killing 29 people, all German nationals. The bus driver and a tourist guide, both Portuguese, also remain in the hospital, according to RTP. BERLIN – The speaker of Germany’s parliament says the far-right Alternative for Germany has no legal right to a deputy speaker, a position it has been unable to get other parties’ support to fill. It is customary for each party in the lower house to have a deputy alongside speaker Wolfgang Schaeuble, a veteran conservative lawmaker, but candidates need to win majority support to take the post. Lawmakers so far have rejected three contenders proposed by Alternative for Germany, or AfD. Schaeuble told news agency dpa in comments published Saturday “there is no legal right” to a deputy speaker, only an “agreement” in parliament’s procedural rules that each party can put forward a candidate. AfD co-leader Alexander Gauland criticized Schaeuble and said Germany’s highest court will have to decide on the matter. BAGHDAD – A summit organized by Iraq is bringing together regional rivals Saudi Arabia and Iran to bridge relations and invest in Iraq. Iraqi Parliament Speaker Mohamed al-Halbousi is heading the one-day summit between Iraq and its six neighbors: Syria, Saudi Arabia, Iran, Turkey, Jordan, and Kuwait. The summit underlines a shift to Iraq’s foreign policy, placing the country as a mediator between neighbors who are often at odds over weighty issues, such as the civil war in Syria, and U.S. sanctions against Iran. Iraqi leaders have emphasized Iraq’s sovereignty since elections last year, and they say it is vital to Iraq’s security and economy to develop good relations with the neighbors. The country is seeking billions of dollars in aid and investment to help it rebuild after 15 years of war. The movement started among provincial workers camped out at traffic circles to protest a hike in fuel taxes, sporting the high-visibility vests all French drivers must keep in their cars for emergencies. It quickly spread to people across political, regional, social and generational divides angry at economic injustice and the way President Emmanuel Macron is running France. At its height, a quarter of a million people marched around France, and polls suggested more than 80 percent of French people supported the movement. Its numbers have dwindled as Macron has addressed some concerns — and as violent troublemakers have hijacked peaceful protests and trashed treasured monuments and police have responded in force. The movement notably attracted extremists from the far right, and now increasingly from the far left, and those exhibiting anti-Semitic views. At first, they wanted an end to the fuel tax hike. The wish list swiftly mushroomed. Most of the demands focus on social justice: lower taxes on workers and pensioners, higher taxes on the rich, more public spending to help the working class. Many want to make it easier for the public to mount national referendums. Some want more action to save the planet. Some want mass nationalization of French corporations, or even full-on revolution. And every week, crowds demand that Macron step down. Macron caved quickly to their first demand, scrapping the fuel tax rise. He offered 10 billion euros in tax cuts or other gestures for pensioners and workers. He doesn’t want, however, to re-introduce a wealth tax, is cool to the idea of national referendums — and has no plans to quit his job. His government launched a national debate aimed at addressing the protesters’ concerns, traveling the country for town hall meetings and collecting complaints online. He’s expected to announce the resulting government measures next week. The hard-core protesters say Macron still doesn’t get it. They see the highly educated former investment banker as a president of the rich, and out of touch with the struggles of taxpayers who help sustain the world’s No. 5 economy. The hard-liners are also pushing for early elections — Macron’s term isn’t set to expire until 2022. His performance this week as fundraiser-in-chief for fire-gutted Notre Dame Cathedral sharpened the anger. Some prominent yellow vest voices are indignant that billionaires quickly offered fortunes to rebuild the landmark cathedral, arguing they should pay more taxes instead. PARIS – Tourists, devout Catholics and others are looking on mournfully at Notre Dame Cathedral, regretting that they can’t get inside the magnificent monument on this Easter weekend because of the damage caused by a violent fire. The Paris fire service said Saturday that the last hot points have been cooled, and firefighters who had worked inside non-stop since Monday’s fire have now left. Crowds lined the embankments across from the cathedral Saturday, taking photos or just staring in shock. 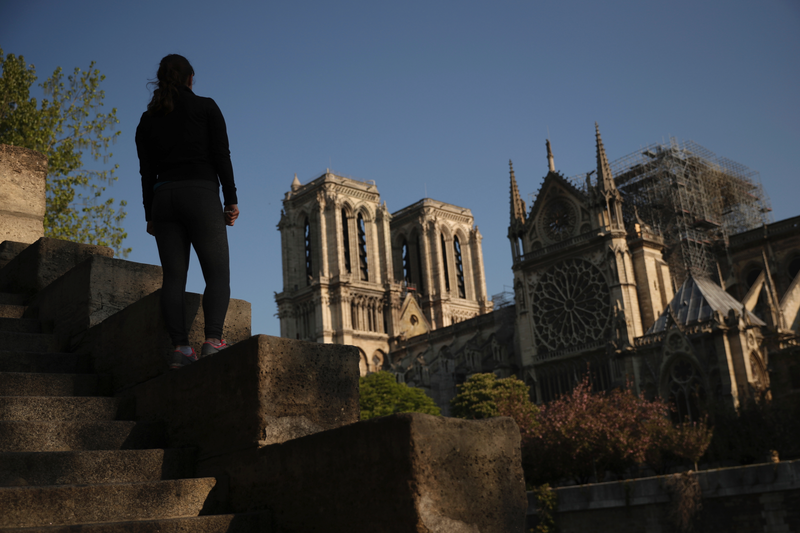 The fire collapsed the spire and destroyed the roof of the 12th century monument, and Easter services normally held in Notre Dame are being conducted elsewhere. Visitor Susan Harlow of Kansas City, Missouri, said: “We didn’t get here in time to see it. And now we probably never will,” given the many years it’s expected to take to repair. KIEV, Ukraine – Ahead of Sunday’s hotly contested presidential election, Ukraine is observing a so-called “day of silence” in which campaigning is forbidden. The campaign hit a dramatic high on Friday night when the comic actor who is far ahead in public opinion polls debated with President Petro Poroshenko in the country’s largest sports stadium. 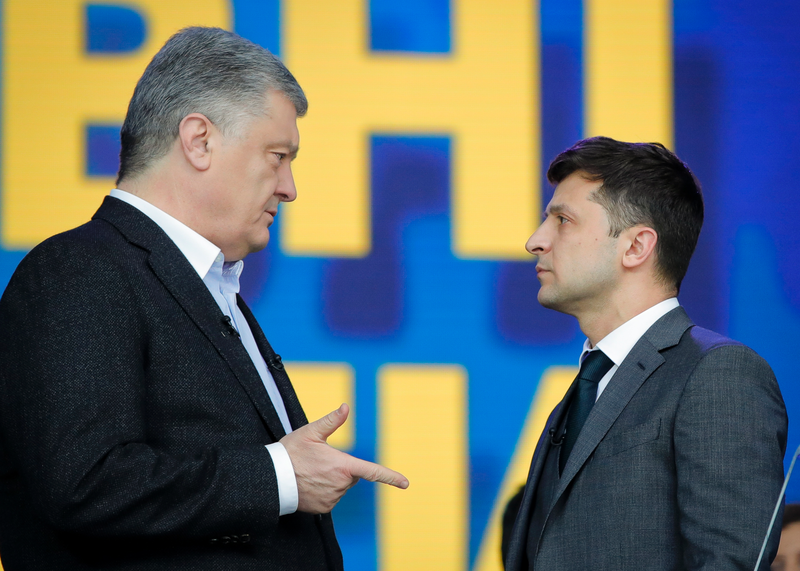 Poroshenko denounced Volodymyr Zelenskiy, who has never held political office, saying he would be too weak and inexperienced to stand up to Russia’s attempts to bring Ukraine back within its orbit. Zelenskiy in turn criticized Poroshenko for failing to rein in corruption during his five years in office. In a melodramatic moment, both kneeled to ask forgiveness of those who have lost relatives in five years of fighting with Russia-backed separatists in eastern Ukraine.